There is a wealth of wisdom to gain from listening to 46 year old RTW manufacturer Rowena Samson Albia. Nanay Rowena Albia’s determination, diligence and discipline makes her an excellent role model for other entrepreneurs. As she shares the highs and lows of her entrepreneurial journey, one can’t help but notice and admire her exceptionally high level of determination, diligence and self-discipline. These three values are among her strongest assets and biggest factors that contributed to her success. 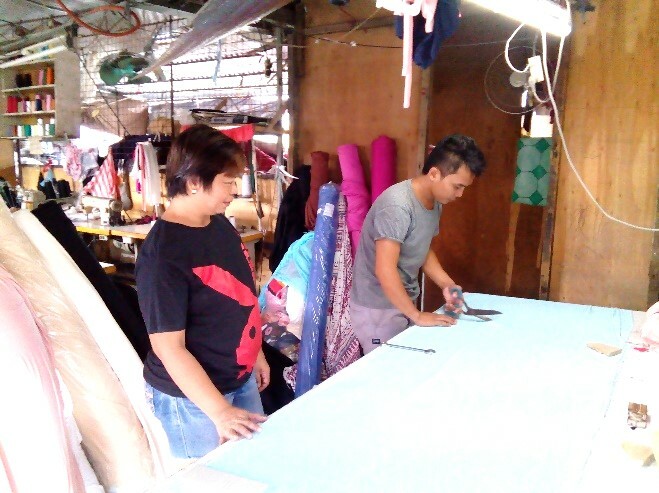 Nanay Rowena took up a vocational sewing course in Novaliches Traning Center way back in 1990. From 1991 to 1997, she worked for an RTW manufacturer based in Monteverde, Taytay, Rizal, whom she deeply admires to this day. “Yung una ko pong amo, mahirap lang noong araw. Yung tahian po niya, sa bakod lang, lupa lang po talaga, tapos may barbed wire lang sa paligid. Masipag po siya kaya napalaki niya po talaga yung negosyo niya. Nung nakontento na siya, tinigil niya na po yung negosyo niya. Hindi niya daw hangad yumaman,” Nanay Rowena recalls. Her third and last employer was a sibling of her second employer, and she stayed with them until 2007. “Okay naman po yung amo ko na iyon, kaso yung asawa niya yung may problema. Mayabang po yung napangasawa niya,” Nanay Rowena confided. The negative work atmosphere with her third employer was a blessing in disguise, for it made Nanay Rowena realize she couldn’t continue working for someone else anymore. In the face of an economic downturn, she saw the potential of establishing her own RTW business. 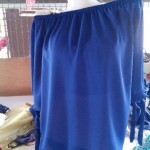 This navy blue off -shoulder blouse is just one of her many fashionable creations. The wife of Tatay Edgardo and mother of five made the decision to start her own business in 2007, but her timing couldn’t have been more perfect. “Matumal po yung bentahan nung 2007 hanggang 2008,” Nanay Rowena recalls. But where others saw the reality of economic decline, her entrepreneurial spirit saw the vision for her own enterprise. 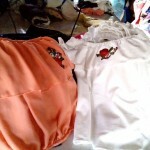 It was exactly during this period of recession in the RTW industry when Nanay Rowena started to build her own business. 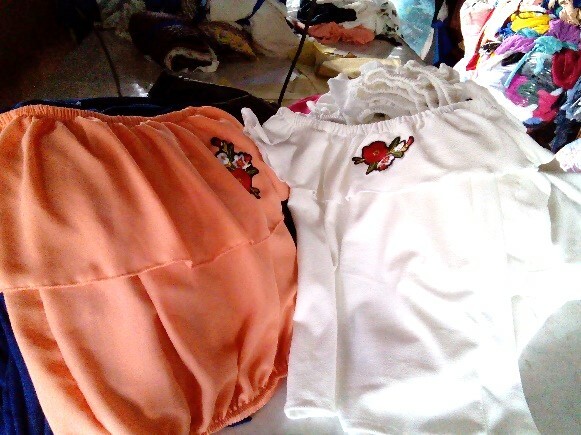 In 2007, she invested the money she borrowed from TSPI to buy scrap cloth, or remnants as the sewers call it, and produced 300 pieces of tokong pants for females. Then she went to Binangonan market to look for a spot where she can sell her products, arriving as early as 4 a.m. to increase her chances of getting a good spot and higher sales. Nanay Rowena’s confidence, people skills and financial discipline allowed her to open up three stalls within just one year. “Lakasan po ng loob. Tanong-tanong sa mga tao saan puwede pumuwesto. Hindi ako mahiyain. Nagamit ko pagiging madaldal ko,” Nanay Rowena laughs while sharing her foray into selling in the public market. 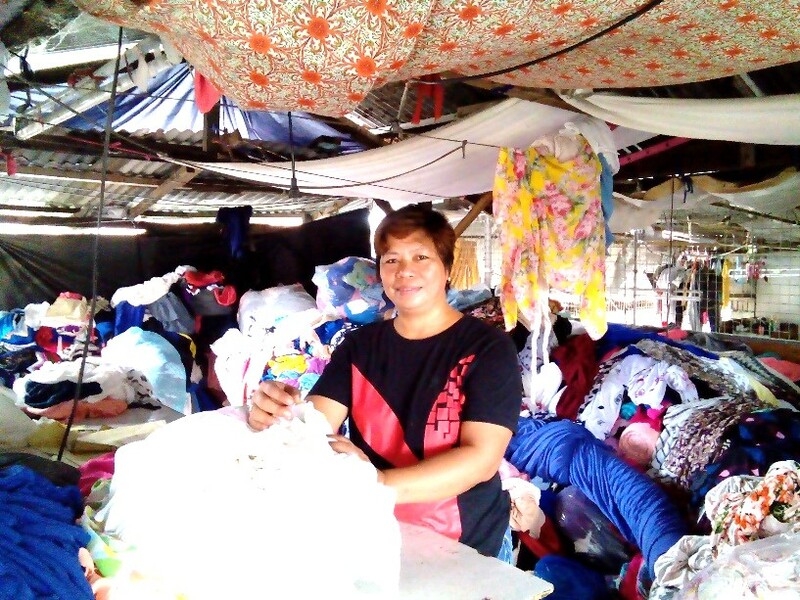 Within one year, Nanay Rowena opened up three stalls: her first in Binangonan, the second in Tanay and the third in Pasig. Using the money she earned from her growing RTW business, she invested in four high speed sewing machines. In 2009, she purchased an owner type jeep used for transporting her purchased cloth from the warehouses. They sold it in 2013 when they realized they needed a closed vehicle to protect their cloth from rain and other harsh elements. But she had another reason for selling the jeep. 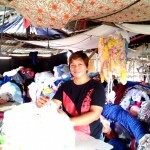 It was during this process of purchasing cloth that Nanay Rowena encountered the biggest challenge to her RTW business. “Nung 2010, may ahente po akong nakilala at ang usapan namin, sila na maghahakot ng tela para sa akin. Ang hindi ko alam, sinisingitan pala nila ng ibang tela yung tela na order ko. Makapal yung tela na sinisingit nila. Nandaya po sila. Hindi ko naman na-monitor yung tela na dinedeliver nila kasi busy ako nun sa pag-ti-tiangge. Kasabay nun, may baguhan akong mantatabas na hindi marunong humipo sa tela. Kaya tinatabas niya kahit yung makapal na tela na hindi naman dapat. Kaya nagtataka ako, bakit lumaki utang ko nun sa kanila, nalaman ko na lang nung na-inspeksyon ko yung tela na dala nila. Kaya namin binenta yung jeep. Nag-start kami ulit,” she narrates the fraud she fell victim to many years ago. Because of her excellent financial management skills and strict discipline, her business’ assets continues to grow sustainably to this day. But Nanay Rowena is not a person who easily gives up in the face of disheartening experiences such as this. Instead, she used this experience to reflect on what she could have done better. Thankfully, Nanay Rowena’s excellent financial management skills and strong discipline enabled her to buy her own, large delivery vehicle. In 2016, she purchased a Toyota Hi-Ace van, which has more than enough room for all her cloth and sewing supplies, under a flexible 5 years to pay installment plan. 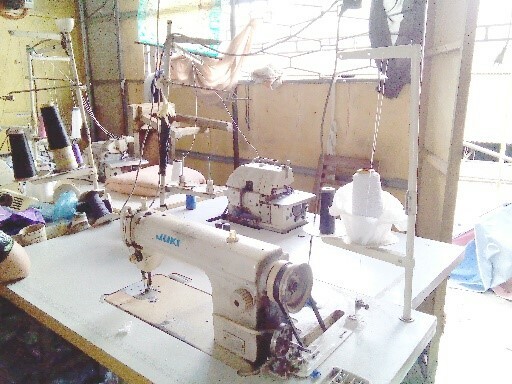 Her growing number of sewing equipment such as this Juki high speed industrial sewing machine is strong proof of her financial stewardship and responsibility. Further evidence of her outstanding financial stewardship is seen in the sheer number of sewing equipment she owns today. 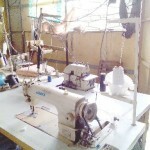 At the time of her interview, she has 30 pieces of high speed sewing machines, four pieces of four-thread overlock machines, two pieces of pangkulot or lettuce design-making sewing machines, two pieces of hemming machines and one button sewing machine. “Kailangan lahat na-bu-budget. Nag-no-note talaga ako kung magkano yung bili ko sa tela at ibang materyales. 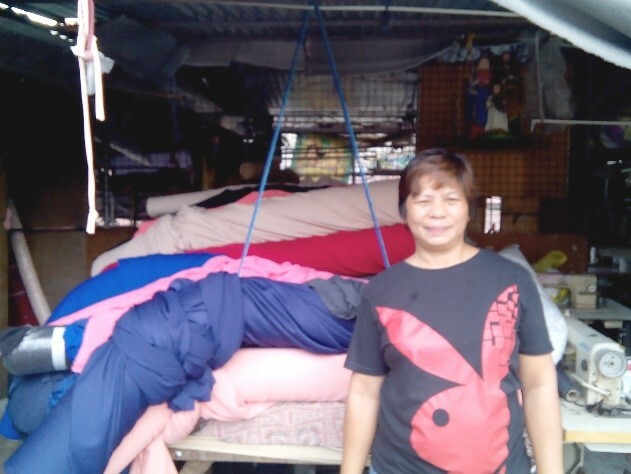 Kailangan madoble ang pinambili sa tela,” Nanay Rowena says, explaining her strategy for running a profitable enterprise. Nanay Rowena takes pride that she has 29 loyal staff journeying with her towards success. With her in this photo is her cloth cutter. Her wonderful people relations skills also rewarded her with 29 loyal staff. “May isa po akong mantatabas, yung nanggugupit o cutter po ng tela. Tapos may 28 po ako na mananahi. Anim po sa mananahi ko stay-in. Yung 22 po, sub-con po sila, pero katabi lang po namin sila sa compound. Tatlo po sa mga mananahi ko, 16 years old pa lang sila, nasa akin na sila. Ngayon may mga pamilya na po sila,” says Nanay Rowena with pride. On top of her five regular big buyers in Baclaran, she also has one big buyer in Pasig. Interestingly, her business’ growth was not adversely affected by her decision to give up her stall in Binangonan and Tanay last 2011. 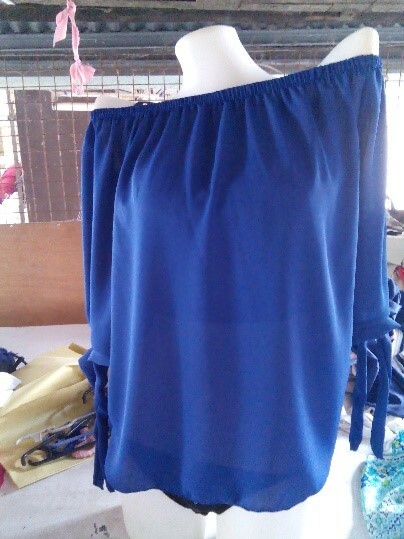 Aside from tokong pants for females, Nanay Rowena now makes ladies’ blouses and jumpsuits. 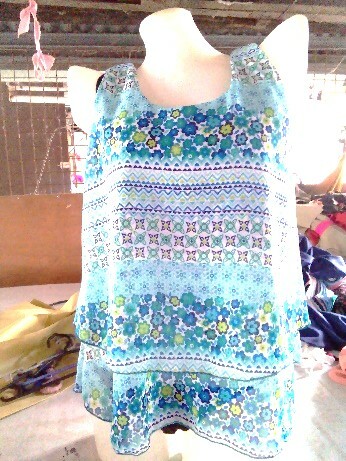 They also make kids’ everyday terno outfits, though on seasonal demand. Just recently, duster house dresses became the latest addition to her RTW selection. 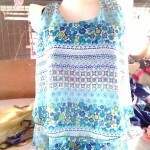 Her design inspiration comes from what she sees celebrities wear on TV and fashion trends that appear on Facebook. 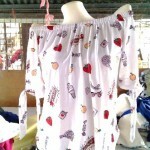 Her fashionable creations such as these off shoulder blouses with embroidery design have already been shipped to different provinces, the USA and Korea. Her products have already been shipped to the provinces of Tarlac, Cebu, Bacolod, Zambales and Batangas, courtesy of one wholesale buyer. Another big buyer brought her RTW products to California, while her entrepreneurial cousin brought them to Korea. But more valuable to Nanay Rowena than all these successes is the fact that she was able to send their five children to school. While her eldest, 25 year old Ryan, decided he’d rather help out his parents in growing their business, the remaining four children have either graduated or are currently finishing their studies. 23 year old Rochelle already earned her HRM degree from the College of St. John Paul II Arts and Sciences, 21 year old JR will graduate next year with an Education degree from the Cainta Catholic College, 19 year old Edric is a graduating Grade 12 student in the APEC School, Taytay and seven year old Sofia just graduated from Kinder level at Shekinah Christian School. As she increases her RTW collection, from tokong pants to blouses such as this, she hopes to make good use of her financial blessings by expanding to the van rental business. Aside from this major accomplishment, Nanay Rowena expects to finish paying for their own lot inside Exodus Subdivision, also in Taytay, Rizal, by August of this year. Achieving all these successes can make some entrepreneurs complacent, but not Nanay Rowena. It is actually pushing her to grow further, sharing her plan to go into the van rental business by December this year and their progress in meeting the financial requirements for the van rental operations. “Mag-invest muna. Mahirap yung utang ng utang. Wala namang napupuntahan,” she quipped. “Hinahanda ko sila. Darating yung time na sasabihin ko sa kanila, ‘Buhayin ninyo sarili ninyo. Mag-e-enjoy naman kami ng Papa ninyo kapag napagtapos na namin kayo,’” Nanay Rowena says, showing her belief in raising independent children. 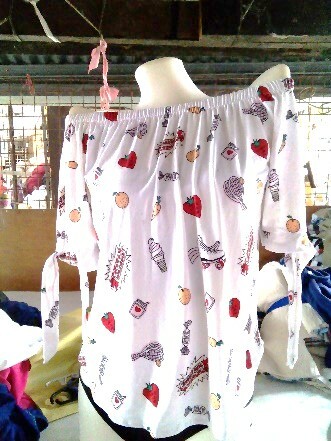 Nanay Rowena is quick to share that her success will not be possible if not for her loyal staff who produces her high-quality products such as this off shoulder printed blouse. She counts her family as the reason behind the hard work and discipline she pours into her business. Ten years from now, Nanay Rowena sees herself as contented with what she has achieved in her business and life, and hopes to still be with her loyal staff as she continues her journey. “Kuntento na ako pagdating ng 2028. May pagkain na sa mesa. May bahay na kami. Tapos na ang mga anak ko sa pag-aaral. Tapos na rin bayad ko sa sasakyan. Pero gusto ko kasama ko pa rin mga mananahi ko. Kasama ko sila sa hirap at ginhawa dito sa negosyo. Kung wala sila, hindi ko rin ito maaabot,” she humbly says. Her advice for start-up entrepreneurs revolve around her values of good interpersonal relations, faith in God and your own ability, determination, diligence and discipline. This is one reason why Nanay Rowena’s success in her RTW business and family life keeps on growing: her words are not just well-said but also well-lived.